question_answer1) Identify the one that does not belong to the given group? question_answer2) Which of the following activities makes air unclean? 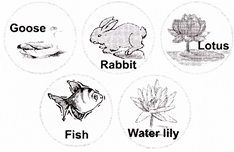 question_answer5) Which of the following is a stem? question_answer6) At what time of the day does the given figure belong to? question_answer7) Identify the living thing. question_answer8) Which of these help in moving a parachute? question_answer9) What is most nearest to the Earth? question_answer10) Identify the burrowing animal. question_answer14) Which of these statements is true? question_answer15) In the given weather chart, which day is sunny and windy? question_answer16) Which of the following spins a web to trap insects and eat them? question_answer17) To which system does the stomach belongs? question_answer18) Which of the these should be used carefully? question_answer19) Which of the following is used to make cement?